A light, flavorful ale with blueberry overtones served with real blueberries. Our best seller! Deep, rich,‏ and creamy stout with roasted coffee and chocolate overtones. A super‏ premium pale ale, light copper in color. Very light in body and dry hopped with cascade hops for a very hoppy aroma. "Ale with an Attitude!" A highly hopped, very strong version of a tradition English Bitter. Clean and crisp with a copper color and a very dry finish. A traditional unfiltered pale ale that has a light body, a hoppy aroma, and a clean flavorful taste. A light-bodied, unfiltered Blonde ale perfect for a hot summer day. Ask your server about our monthly ale special. Thin crust pizza with a Sriracha base and topped with grilled lime chicken, tomato, bermuda onion, jalapenos, cheddar cheese and fresh cilantro. Thin crust pizza with a cranberry mayo base and topped with bourbon marinated turkey tips, homemade stuffing, caramelized onions, and cheddar cheese. Hot wings served with celery and bleu cheese dressing. Also available Southwestern BBQ style. Boneless buffalo OR southwestern BBQ chicken fingers. A sampling of three appetizers: chicken fingers, Italian fried cheese, and Wild Bill Boneless wings. Served with bleu cheese dressing, marinara sauce, and honey mustard for dipping. Homemade seafood stuffing served in a shell. Top with bacon for $1. Lightly battered calamari fried to a golden brown. Topped with banana pepper rings and served with marinara sauce and balsamic glaze. Always homemade, always delicious. Served with cheese, onions, and tortilla chips. Fresh clams, onions, celery, and potatoes in a rich and creamy base. Hearty beef‏ stew with red bliss potatoes served in a toasted bread bowl. Homemade chicken stew or beef stew topped with flaky puff pastry. Chipotle spiced bison burger topped with cheddar cheese and black pepper crusted bacon. Seasoned with Cajun spices and topped with crumbled bleu cheese. Topped with avocado pico de gallo. Add bacon $1. Topped with‏ Gouda cheese, BBQ sauce, bacon, grilled bermuda onions. All sandwiches are served with choice of french fries, chips, pasta salad, or coleslaw. Sweet potato fries available for $1.25. Grilled chicken breast topped with American cheese, bacon, lettuce, and tomato on a brioche roll. Grilled chicken breast topped with bleu cheese dressing, red hot sauce, lettuce, and tomato on a brioche roll. Grilled chicken breast topped with prosciutto, avocado, lettuce, and tomato on a brioche roll. Fresh lobster salad on a grilled brioche roll. Chunk white‏ tuna, American cheese, lettuce, and tomato on a wheat roll. Lightly breaded boneless chicken breast topped with tomato sauce and mozzarella cheese and served on a brioche roll. Salad Dressings: Olive Oil, Bleu Cheese, Greek, Italian, Balsamic Vinaigrette, Zinfindel Vinaigrette, Caesar, Ranch, Honey Mustard. Crisp romaine lettuce tossed with Caesar dressing, croutons, and romano cheese. Fresh lobster salad served alongside an arugula and mixed green salad and roasted vegetables. Fried chicken tenderloins dipped in our spicy buffalo sauce served over a large tumbleweed salad. Also available with grilled chicken. Arugula and mixed greens salad with roasted vegetables. Served with a flour tortilla shell, avocado pico de gallo, jack cheese, and a lemon vinaigrette. Char-broiled, marinated steak tips. Served with rice pilaf and vegetable of the day. Add sauteed onions and peppers for $1.50. Add sauteed mushrooms for $1.50. Charbroiled 12 oz. rib eye topped with crumbled bleu cheese and black pepper crusted bacon. Full rack of slow cooked ribs smothered in homemade BBQ sauce. Served with cornbread, mashed potatoes, and slaw. 1/2 rack available for $12.95. Thinly sliced, open faced prime rib sandwich with black pepper crusted bacon, gouda cheese and grilled bermuda onions. Served with fries. SERVED FRIDAY AND SATURDAY AFTER 5 PM WHILE IT LASTS. Slow roasted 14 oz. boneless prime rib au jus. 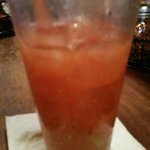 SERVED FRIDAY‏ AND SATURDAY AFTER 5 PM WHILE IT LASTS. Slow roasted 12 oz. boneless prime rib au jus. Marinated chicken sauteed with basil and garlic tossed in a parmesan tomato sauce. Served over penne pasta and garlic bread. Lightly breaded boneless chicken breast topped with tomato sauce and mozzarella cheese. Served with penne pasta and garlic bread. Slow roasted 20 oz half chicken finished on the grill with lemon. Served with mashed potatoes, vegetables of the day, and cornbread. Seasoned, balsamic glazed chicken breast topped with mozzarella cheese, tomato, and prosciutto and finished with fresh basil. Served with roasted asparagus and rice pilaf. 8 oz. wild caught salmon topped with panko bread crumbs and freshly ground pepper. Served with vegetable of the day and choice of mashed potato, rice pilaf, or french fries (baked potato available after 4 pm only). Seasoned salmon served with grilled vegetables and a Mesclun salad with dried cranberries, red onion, and choice of feta or goat cheese. Fresh haddock filet topped with grilled asparagus and lemon-cilantro butter. Served over baby arugula and with rice pilaf. Fresh haddock filet baked with panko bread crumbs and topped with bay scallops lightly sauteed in garlic butter. Served with vegetable of the day and choice of mashed potato, rice pilaf, or french fries (baked potato available after 4 pm only). Lightly fried haddock filets served with flour tortillas, jack cheese, avocado lime pico de gallo, sour cream, and southwestern slaw. There is something for everyone on the menu. Staff was attentive and friendly. Everyone enjoyed their meals. I recommend the pastrami pizza, very good. If you're looking for pub style food you won't be disappointed. Popular local hang out , the beer selection is great and the service is friendly . I like to support the place because the ownership is very generous to local charities and sport teams !!! 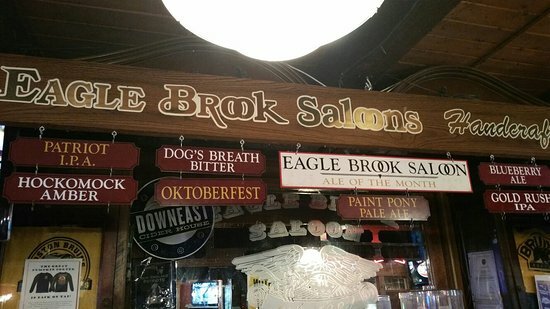 I have been coming to The Eagle Brook since the big Eighties, I love it here, great atmosphere, staff is always super nice, food is great, beer is even Greater! Food was o.k. We were seated in an area with 3 tables. Seating in restaurant is much too close....can't even move your chair without hitting next person's chair in table next to you. Can't have a conversation without everyone in the room hearing you. 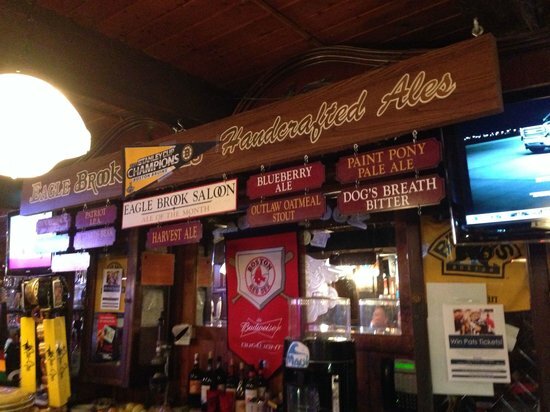 Eagle Brook Saloon is a totally locals' favorite place for food, pizza, craft beers, etc. The entire place was filled with families, diners, all having a great time. Loud, but in a pleasant way. Kids welcome. Staff very friendly. Plenty of parking. Don't miss it. 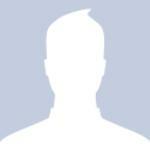 Get quick answers from Eagle Brook Saloon staff and past visitors. What is offered on its regular menu? They have Pizza, which is buy one get on free on certain days, salad's, soup's including chowder and chili, burgers and full dinners as well. I have not tried the steak tips but I heard they were very good.